(bases of robots in RoboRally are hand painted, but with much care and great colors. They actually make gameplay easier). Games are complete and in excellent condition. 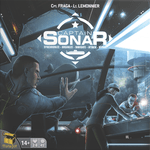 Captain Sonar has been opened, but has never been played.